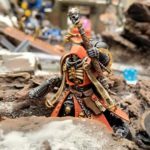 This year I went to the NOVA Open weekend for the first time. I went with Colin & Jason W for the Trios Tournament and 40k Narrative Warlords+Nightfighter, while John L and Carl also went for the two Narrative tracks. 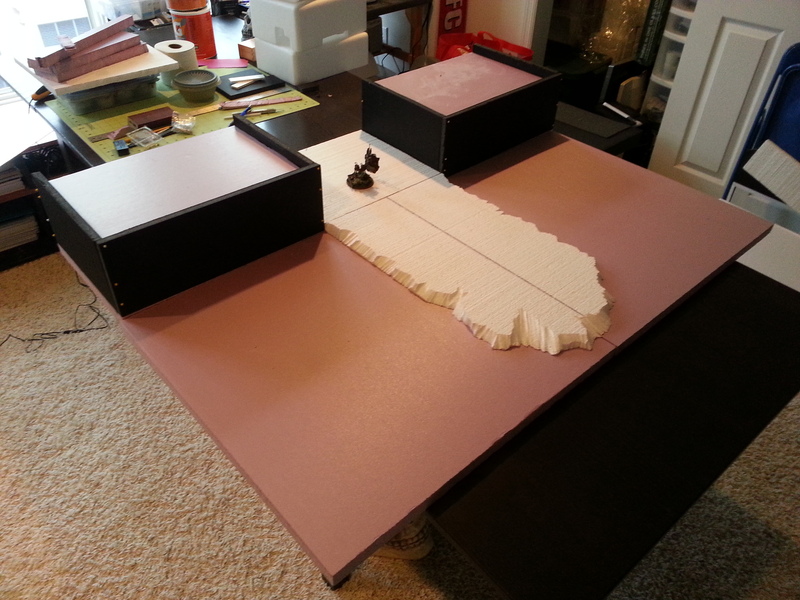 The Harmons also came down for the Warmachine/Hordes and Infinity tournaments. I’m hoping to have a couple posts up this week recapping the whole affair. First up is my first event: The Trios Tournament with Jason and Colin. It’s a cool format, in which three players team up to each play two 1000pt doubles games and a single 2000pt solo game; each round the team gets to choose the doubles based on their match opponents and mission. 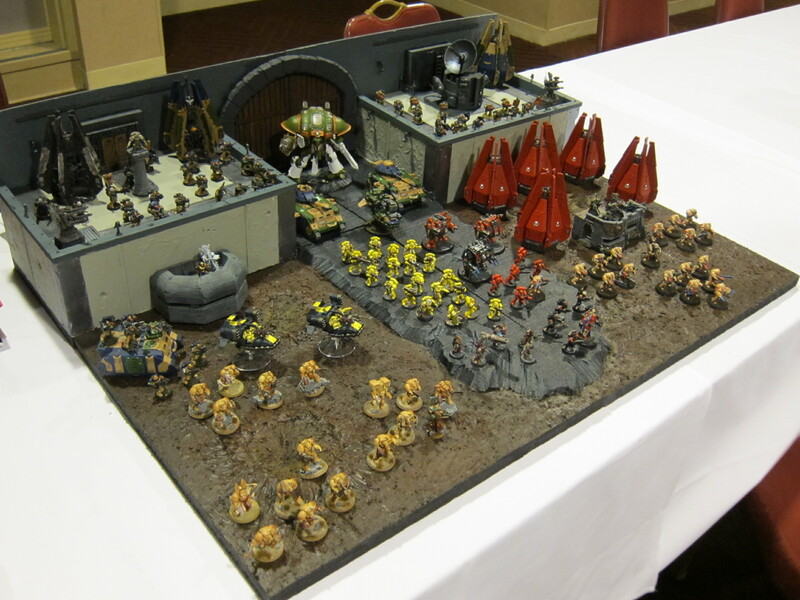 There was also competition for Best Theme, encompassing the narrative story of why your armies are fighting together, the display board, and overall appearance. We spent a ridiculous amount of time on this part when we should have been just practicing. 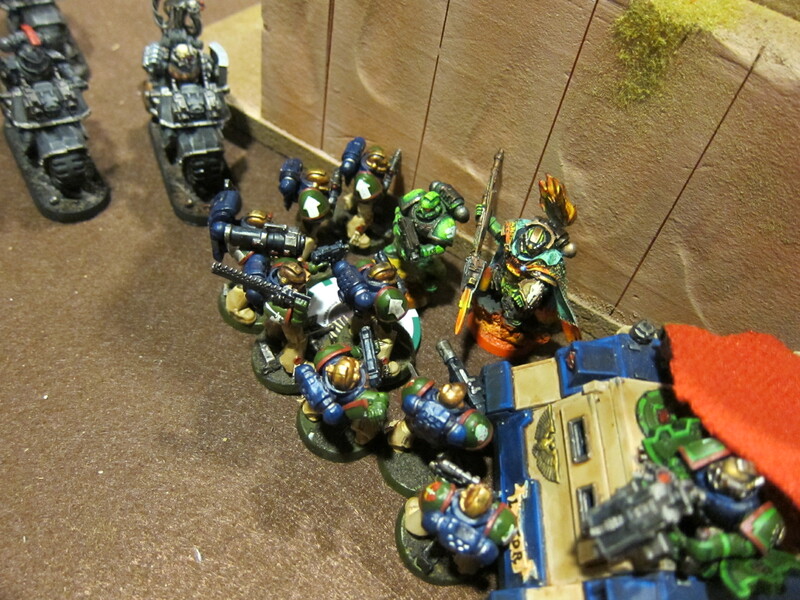 Our final story was vague but something along the lines of the Kingbreakers emerging triumphant from their fortress monastery after returning with Dark Angels, Imperial Fist, and Blood Angels friends to retake it years after the fall of Forestway. 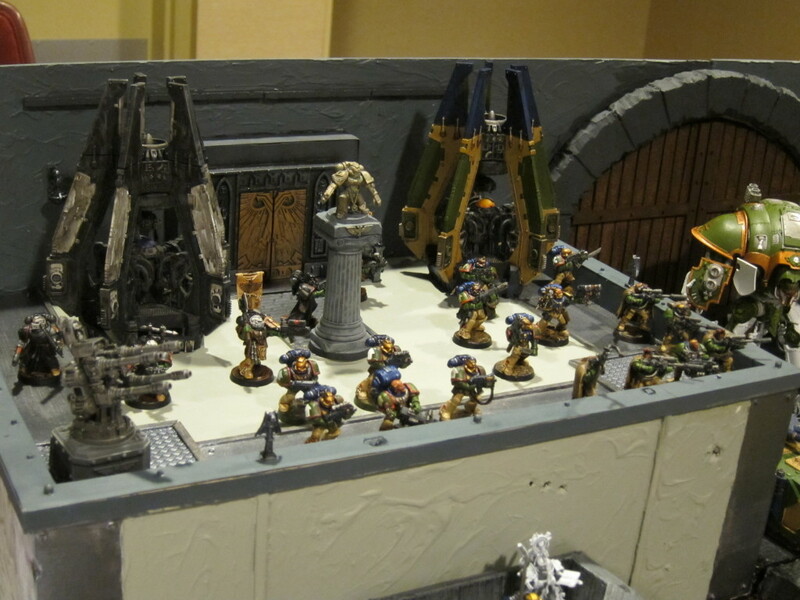 In the end sizable chunks of our armies weren’t finished, barely primed in my case, and there was no detail painting on the fortress, but the sheer size and detail combined with the all-Space Marine armies made it look good. The display board two weekends out. 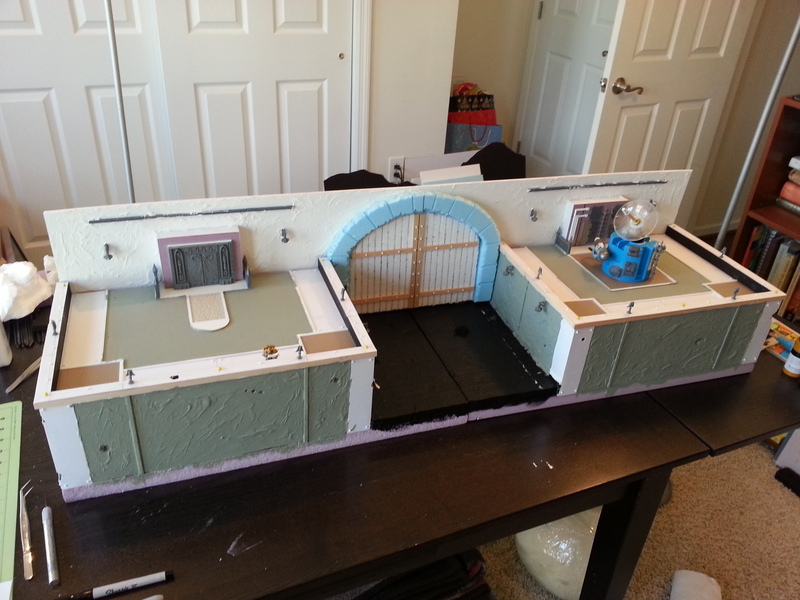 The fortress the day before the tournament. Furiously painting literally through the night going into the tournament. No castle’s complete without a turbo-laser. 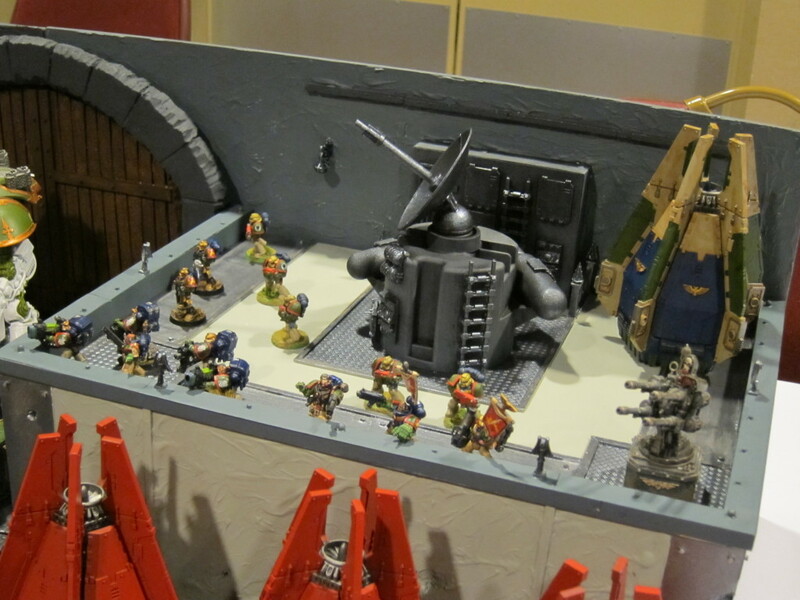 A few more photos of the individual models and armies are in the Flickr gallery. Jason & I vs Ryan & Andy’s Necrons and Eldar: Crushing loss (1 to 10). This mission was cumulatively scoring objectives, all three of them placed along the diagonal outside the Vanguard deployment zones. We just didn’t score enough points each turn to keep up. Their Wave Serpents had more than enough mobility to contest my Drop Podding guys on the quartile objectives, with Objective Secured overriding my Sternguard on one. Critically my third Drop Pod did not come in from reserve in time to contest the central objective and prevent the Necrons from swarming all over it. Meanwhile a Crimson Hunter went wherever it was needed and blasted away at our Imperials. The Silent King’s troops awaken. 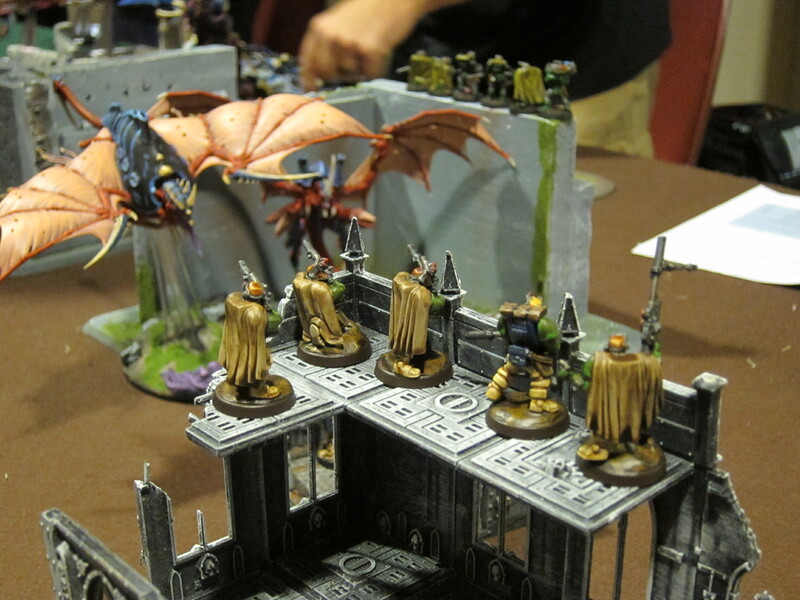 Kingbreakers huddle up amongst the ruins of a xenos invasion. Colin & I vs Todd & Ronald’s Eldar and Tyranids: Crushing win (5 to 2). 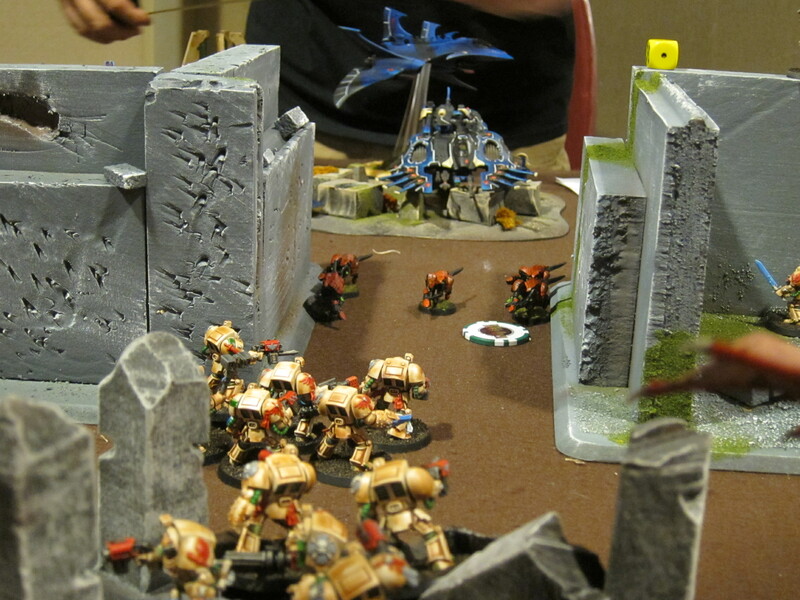 Five objectives, scored equally at game end, Hammer and Anvil zones. We were up for a while, but they pulled it together to make it a close run thing in the endgame. 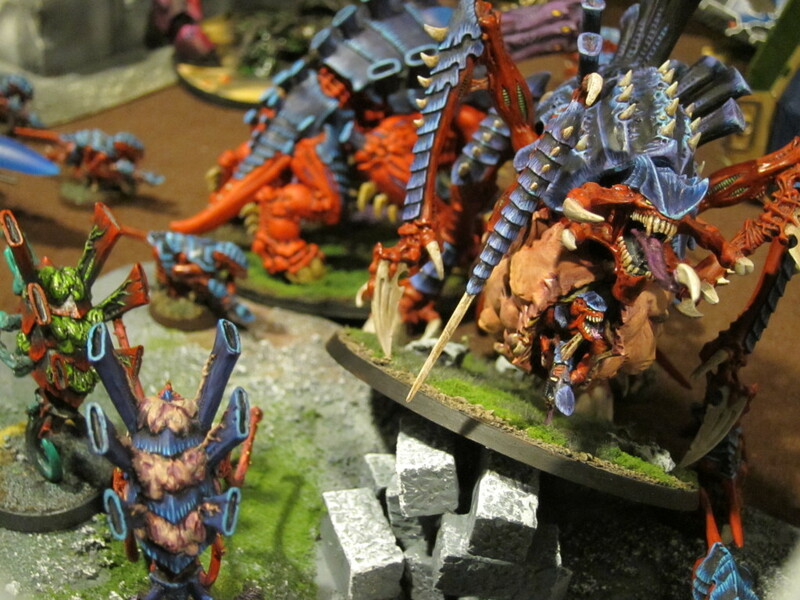 Our forces spent a lot of time fighting back Tyranids, which left a lot of very mobile Eldar to branch out at the end toward multiple objectives. Fortunately we had the right guys in just the right places all over the board and made some lucky rolls in the closing moments: Scouts assaulted some Windrider Jetbikes that had swooped onto our home objective and made enough saves to contest the ground; Tacticals made a hard rush on foot to run around a Wave Serpent and contest Dire Avengers on our previously unprotected home flank by mere fractions of an inch; Terminators crushed several monsters to claim table center; Belial and Captain Angholan tanked a punishing amount of fire to shield Sgt Scolirus as he powerfisted a Wave Serpent into oblivion in the last moment to claim an opposing home objective. All of that happened in the bottom of the last turn as time ran out! 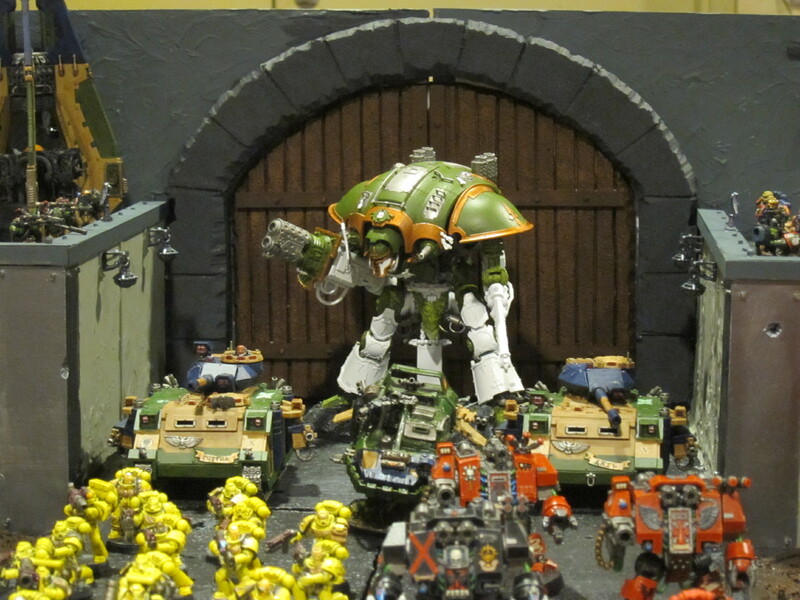 Terminators flood the corridors of the ravaged city. 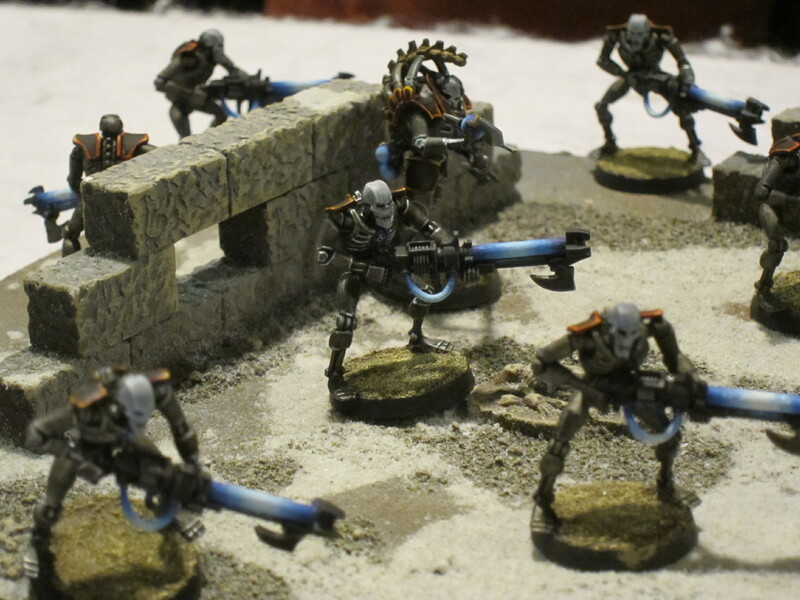 Belial and Scolirus lead the forward charge. 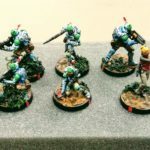 Me vs Jason’s Salamanders: Minor loss? Draw? I can’t actually remember and didn’t write it down, but believe the former. 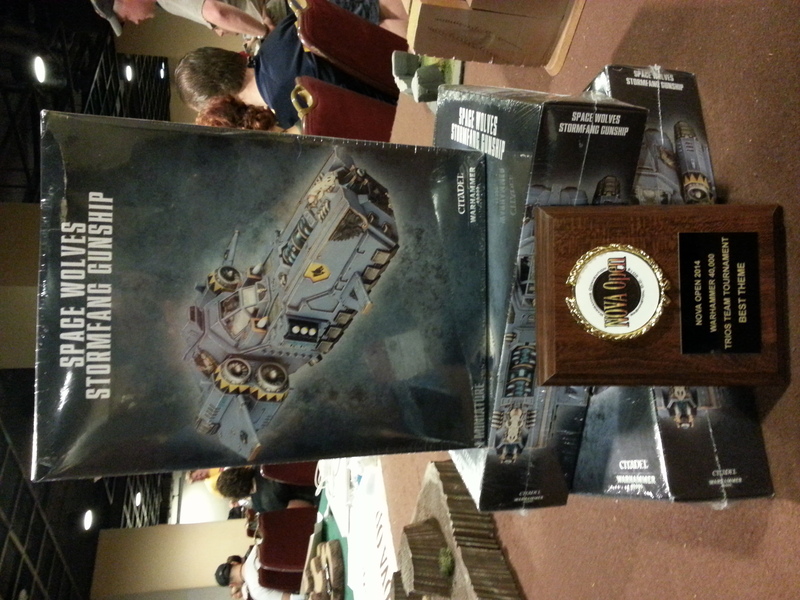 Mission was Dawn of War deployment, four objectives plus the Relic at table center (a moveable objective). This was also a close game, though I’m fairly confident that if I had another shot at it I could convert this near mirror match into a win. 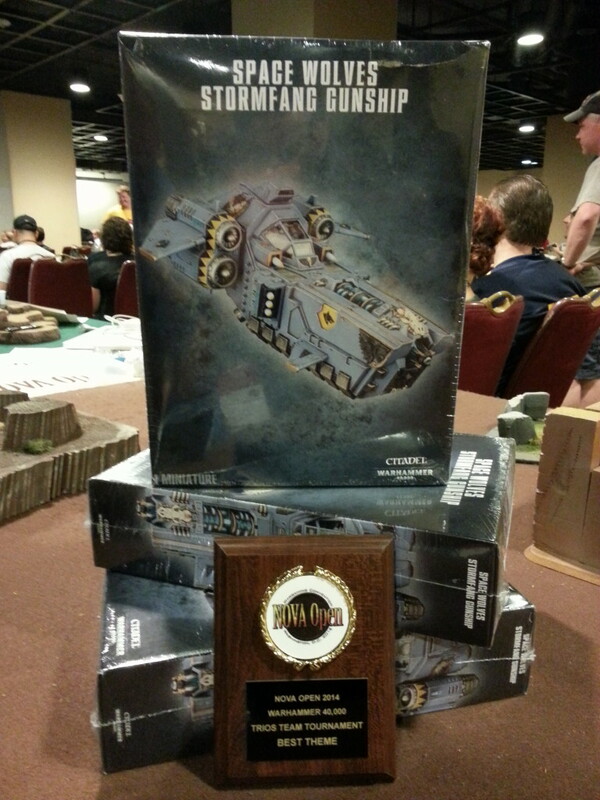 By this point I was going on nearly no sleep for many days between prep, driving, and non-40k activities in the preceding week, and had been playing 1000 points for both of the previous games. All of a sudden I had to switch mindset to a 2000 pt army and just didn’t make the transition well. For literally more than half the game I totally forgot about Coteaz, and made a number of other similar mistakes throughout. Without that sloppyness alone I think it would have ended very differently. 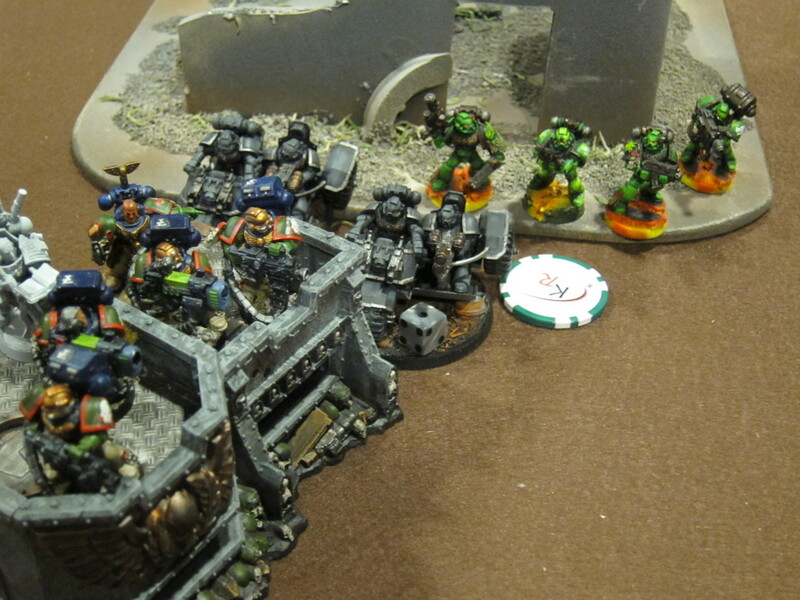 One interesting thing was that Jason’s Thunderfire Cannon really hampered my Knight, forcing it to move as if in difficult terrain via Tremor shells and preventing it from clearing the large line of sight blockers at table center fast enough to get shots on critical targets. 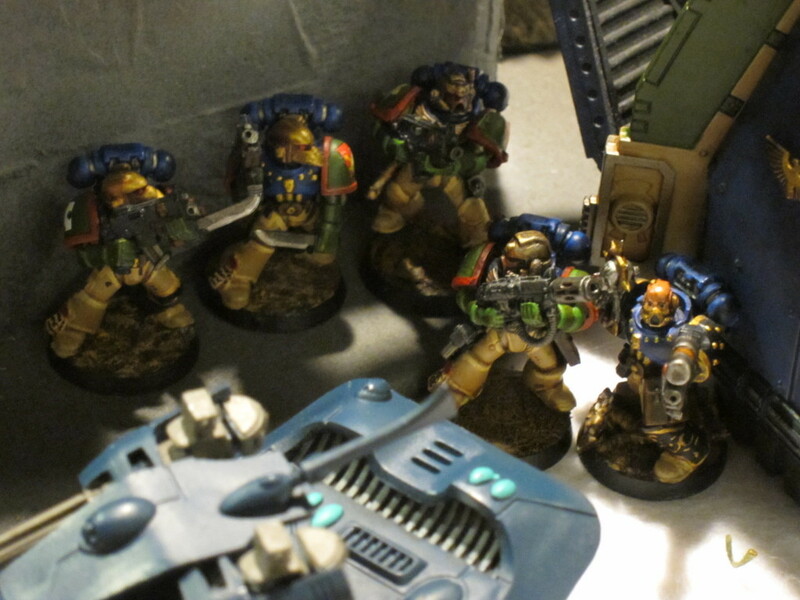 Squad Titus corners some jerk named Vulkan. I have no idea where we placed, but I’m sure we were down near the bottom. Results were never published as far as I know. This was one of the three execution areas to be improved in an otherwise really fun & interesting tournament. Another was that set-up, judging, and player voting for army theme & appearance was somewhat slap-dash and disorganized. Hardly anybody actually saw our display because there was no set time or space for checking out everyone’s setups and ours wasn’t practical to have up all day, something we have to keep in mind for the future. 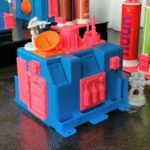 Finally, the rule packet could also have stood quite a bit of editing and clarification, which we’d be happy to help with. 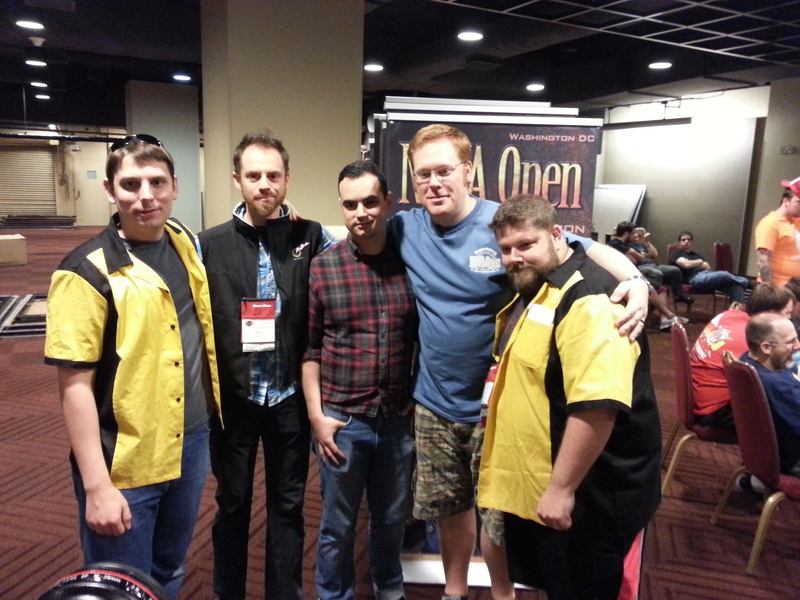 However, the TOs Troy and James were great guys and it’s a fun, novel tournament format. I really enjoyed it despite not doing well. I think I’d like to see the solo mission reduced in points so it’s less of a leap from the 1k games if you play it at the end of the day, but also appreciate the challenge of handling both and making that transition. I would definitely be up for this event again. In the end though we did win the Best Theme award. Another team apparently actually won the voting, but they also won the tournament overall so we got bumped up. This was pretty cool, and definitely rewarded both the effort on our fortress monastery display board as well as not going with a more powerful but random, non-fluffy collection of armies. 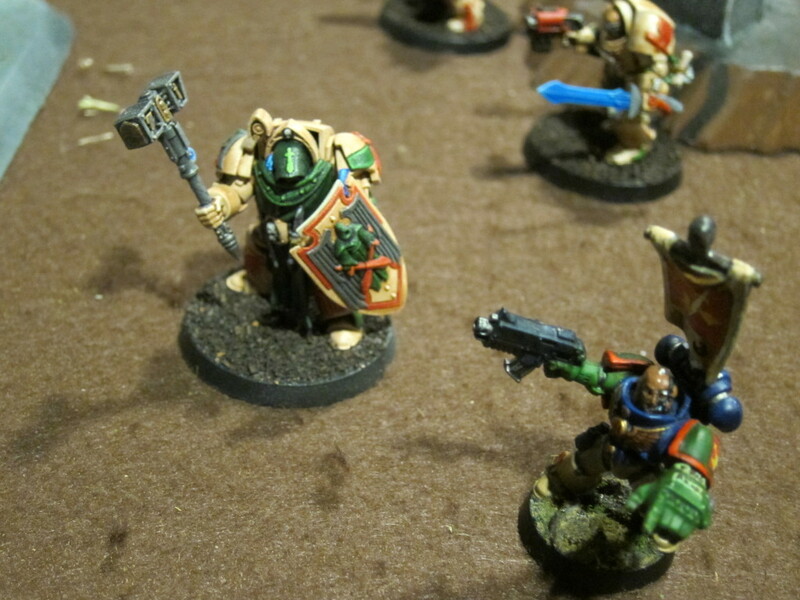 Again, a few more photos of our armies and many from the games are in the Flickr gallery. The team w/ tournament organizers James and Troy at the awards ceremony. 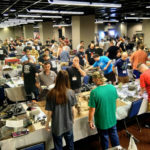 This entry was posted in miniatures and tagged 40k, battle report, blood angels, dark angels, eldar, featured battle report, imperial knights, kingbreakers, miniatures, narrative, necrons, nova, page, painting, space marines, terrain, tournaments, tyranid. Bookmark the permalink.